A virtually unbreakable polycarbonate 3 pint or 1.7L jug / tall pitcher with lid. Ideal for pubs, clubs, outside events like weddings and around the home for parties. Price per jug. The Lid has a toothed side to act as a filter for ice cubes and fruit as well as being a dust cover. Ideal in the summer for serving Pimms. 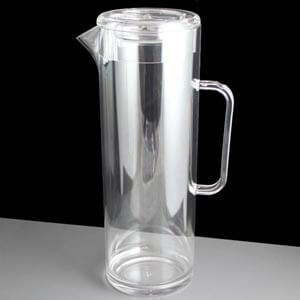 These polycarbonate jugs are good for up to 500 washes before showing any signs of wear and tear. Feedback for 3 Pint Tall Pitcher and Lid - Required: Box of 4 has been compiled from 0 reviews.